More than 30 members on the tour connect with local leaders in business, economic policy and other industries. The Washington Study Tour from July 26 to July 31, 2015 was an opportunity for students, alums and staff in Webster China's Joint MBA programs to focus on business and economic issues vital to China, the U.S. and the rest of the world while connecting with leaders from finance, economic policy and other industries throughout the national capital region. 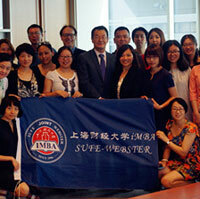 Months before this group of MBA students from Webster’s SUFE and UESTC joint programs took off for the U.S., they examined the issues making the U.S. more economically attractive, and at the same time, considered important issues in China that might be compared to U.S. experiences. An afternoon with Washington Beltway Consultants, organized by Sean Coleman, director of Webster's National Capital Region campus locations. Coleman assembled a full panel of expert speakers on real estate, investment instruments and valuation. See more photos and read more details from the trip in this story at Webster China.